Birmingham Symphony Hall is turning itself 'Inside Out' with a free one-day festival on Saturday July 15, 2017. Symphony Hall: Inside Out will feature unexpected sounds in unexpected places, with visitors able to see the venue as they've never seen it before. Taking place from 10am till 11pm, the fun includes music performances on three different stages, a kids' cinema and silent disco, brass band trails, drum & bass sessions and a photography workshop. Digbeth Dining Club will be on hand from 1pm to provide a variety of street food from the likes of Libertine Burger, Pietanic and Cornography. As well as the main Symphony Hall Stage, two specially constructed performance area will be used, in the loading dock - an industrial space at the back of Symphony Hall - and in the adjoining Bay C - the Symphony Hall car park. Performers include UK beatboxing champion Grace Savage, Afro Fusion band Yaaba Funk, Birmingham's Bostin' Brass and neo-soul band Lucinda. The first part of the day, running from 10am till 5pm, will be family-focused, with activities taking place across the Symphony Hall foyers and usually 'out-of- bounds' back stage areas. The programme features a silent disco in the VIP Lounge, a kids' cinema in the Heineken Bar, in-the-round performances on the Symphony Hall stage, musical picnics in the loading dock and brass band trails where visitors will be able to explore every corner of the venue. The second part of the day, from 5pm till 11pm, is targeted at older festival-goers. There will be secret drum & bass sessions from HEADGEAR in the underground orchestra pit beneath the Symphony Hall stage, loading dock gigs, including London Afrobeat Collective and Birmingham-based Misty's Big Adventure, and acoustic music curated by the Project SoundLounge Collective. Photography at Symphony Hall shows is usually restricted but for Inside Out there will be photo access to all areas. Budding snappers can also sign up to take part in photography workshops, giving them the opportunity to receive guidance on taking live music photographs before putting what they've learnt into practice at events on the day. Toks Dada, Symphony Hall Programme Co-Ordinator, says: "Large music venues can often be a barrier for people who wish to enjoy great music but simply don't feel the venue is for them. 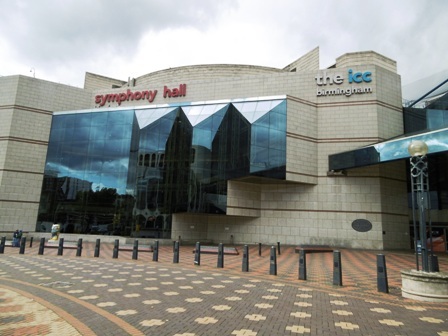 At Symphony Hall we believe that everyone should feel welcome, which is why we're delighted to be producing this free festival for the people of Birmingham."